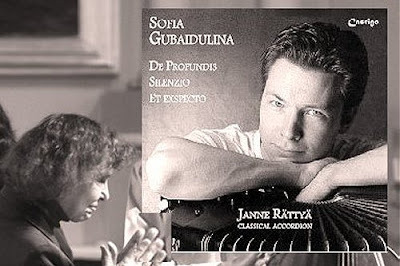 Email received: - One of the most prolific composers of accordion music is Sofia Gubaidulina. Her "De Profundis" is a standard in the modern literature. Russia and Ukraine actually have a large amount of accordion players (and bandoneon, etc), as well as composers for the instrument. The Hex Ensemble in the '90's in Holland had an accordion player as part of the ensemble, and many composers, such as Alison Isadora, Richard Ayers and Geoffrey King wrote for them. Also, the Newt Hinton Ensemble (France, Holland, Germany) had an accordion in the group. There was a Trio Strakke Lucht in Holland made up of three accordions, I believe. And Ananda Sukarlan, a wonderful Indonesian pianist living in Spain, had a duo for several years called Anaki, which generated lots of new works in Spain and other countries. In Norway I heard a really good piece by Sam Hayden for the accordionist Frode Halti during the 2004 Ultima Festival. Actually, at the Gaudeamus Interpreters Competition (biannual, for the interpretation of modern music) one of the most popular entry instruments is accordion. Maybe there are just not so many recordings of accordion music. Or maybe the instrument is more prevalent in certain regions than in others. For instance, there are many people in Finland who study the instrument. In Holland there is a composer named Marion de Laat who plays the accordion and writes multimedia works for electronics, accordion and even dancers. While on the subject of accordion music and Finland, I thought the following would be of some interest for the readers of this blog. Veli Kujala, a young Finnish accordion player, has invented a quarter tone accordion. Last year, the young Finnish composer Sampo Haapamäki wrote a concerto for this peculiar instrument. The first performance of this work, with Veli Kujala as soloist, was at the beforementioned Gaudeamus Festival in September 2008. The Finnish premiere of the work took place last week, with Veli Kujala, Stefan Asbury and Tapiola Sinfonietta (of "Overgrown Path" fame). Read more about the work and the instrument here. How could I have omitted Pauline Oliveros? Don't forget Howard Skempton, there is a great album on Mode called Surface Tension of his pieces for soprano and accordion.